I'm not much of a baker. I love sweets but I prefer to cook as you don't need to be so exact with each ingredients and there is less improvisation in the process. This recipe was sort of an accident. I was hungry for breakfast and nothing but the staples were in my kitchen. So, I blended up some simple and healthy ingredients in my food processor, let it bake for a few and then was pleasantly surprised when these came out of the oven. They didn't rise, they're certainly not the prettiest dish I have ever created, but I still wanted to share this recipe because they are (or I should say were because they are lllooonnnngg gone) really delicious and satisfying. These babies are also so simple to make. Even this baking rookie didn't screw them up. Place liners in the muffin pan. Toss all of the ingredients (minus the chocolate chips) in the food processor and blend until smooth. Fill the muffin liners with the batter. This amount of batter made 8 muffins. Sprinkle 7-10 chocolate chips on top of the batter filled liners. 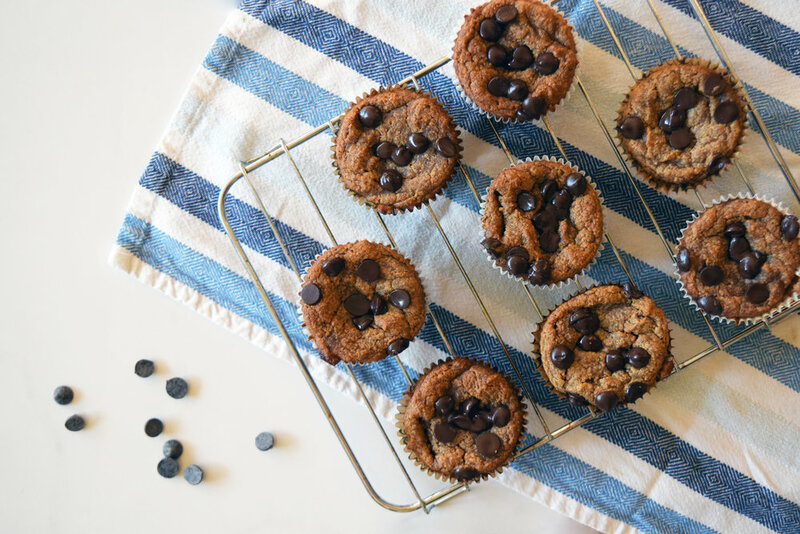 These muffins are soft and gooey so you don't need chocolate chips inside the muffin as well. Bake for 25 minutes. Test with a toothpick- they're done if the toothpick comes out clean. Let cool and store in an air tight container for up to a week. I think these taste best at least a couple hours after baking.